Clothes and watches | What Car? The Martini logo was rarely more evocative than when it appeared on the side of the Porsches that won Le Mans three times during the 1970s. 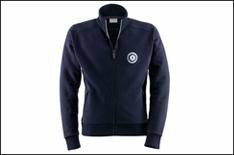 This partnership is celebrated by the Porsche Design Drivers Selection, which includes this sweat jacket with contrasting inside collar and Martini Racing stripes sewn into the cuffs. This watch has been designed by Audi to be clear and minimalist. It is made from scratchproof stainless steel, the casing is satin finished and its water resistant up to 100 metres. Audi says the vegetable-tanned cowhide leather strap enhances comfort and the Swiss-made ETA 2824-2 automatic watch movement ensures 'precision engineering excellence'. The garish blue colours of the Chevrolet motorsport team that won this years British Touring Car Championship with Jason Plato might not be to everyones taste, but fear not, this 100% cotton polo shirt with the Chevrolet logo embroidered into the chest comes in plain black or white. These stylish surf shorts are part of Fords kinetic design range and have white edging, side pockets with Velcro fastener, a Ford logo embroidered on one leg and a mesh insert. They are made of 100% micro-polyester and are water-repellent, of course. Get someone dreaming about those far-off summer holidays. Rugby is not the most obvious thing you associate with Mercedes-Benz, but this mens rugby shirt would make a great gift. It is made of 100% cotton and is available in dark blue with beige stripes and a white collar. It has the historical Mercedes-Benz star logo stitched on the left chest. This is the most expensive of Alfa Romeos range of watches and it has been designed to be sturdy rather than stylish. It is constructed out of titanium and carbonfibre and is water resistant. The famous Alfa logo appears in silver on the bezel. The closest many of us will come to owning a real Ferrari, this Swiss-made watch has a stainless steel case, leather strap and is water resistant up to 10 metres. The Ferrari logo appears on the case backing, on the dial and on the butterfly buckle. It comes in a presentation case, too. Renault says this body warmer is perfect trackside wear in conjunction with other items in its Renaultsport range. It is 86% polyester and 14% spandex, and is water-resistant and wind-proof. There is a two-colour print on the front and sides, and the Renaultsport logo appears on the back. This one-size-fits-all cap with adjustable strap is made of 100% cotton and forms part of Mazdas Zoom Zoom range. It has Mazda branding, blue detailing and the Zoom Zoom logo embroidered on the front. Know someone who's just had a baby? Then forget about going down the teddy bear and flowers route and instead give their newborn petrolhead a fully branded romper suit direct from Porsche. Comes in sizes 56/62, 68/74, 80/86. For baby boys and girls.